If you play the sport of Elin Nordegren’s husband, as hundreds of us from Cebu do, then you must escape from work today and tomorrow. Seriously, you must. You ought to sprint to the Cebu Country Club; spend one, three, 14 hours there. It’s not a waste of time. It’s valuable time spent. The reason: The Aboitiz Invitational Golf Championship. Sponsored by the most influential and respected brand and family name in Cebu—Aboitiz—this event is a must-see, never-to-be-missed spectacle. It’s three days, 54 holes and 16,368 shots of spectacular golf. I shook his hand. Observed his phenomenal drive. With my tennis buddy Macky Michael (an 8-handicap golfer) driving the wheels of the golf cart, we caught Angelo at the 10th hole. It was 2:45 in the afternoon. Then, at the 11th hole tee mound, we watched. Wearing a white shirt, white cap, beige pants, white shoes and donning red, one-way sunglasses, the 31-year-old readied to swing from the tee. BANG! I’ve never seen anyone hit harder. Then, minutes later when we inspected his shot, in the 513-yard Hole No. 11 of the CCC, his ball landed 180 yards from the pin. Macky’s estimate: He drilled that dimpled ball 330 yards away. Waiting near the 11th hole green (and thanks to the quick introduction by fellow Cebuano Oliver Ong), I got to shake Angelo Que’s hand before he walked to the green. “Bad luck handshake,” I call it, because while he was putting for eagle, he missed… and missed… settling for a three-putt and a disappointing par. Toby Florendo was there. While we chatted, someone shouted “FORE!” We covered our heads. In a millisecond—smack!—the ball hit. Not Toby, but just a foot away, one of the player’s golf bags. It was funny. Scary. And, as Macky pointed out, would have made this article’s Headline News had Toby been struck. 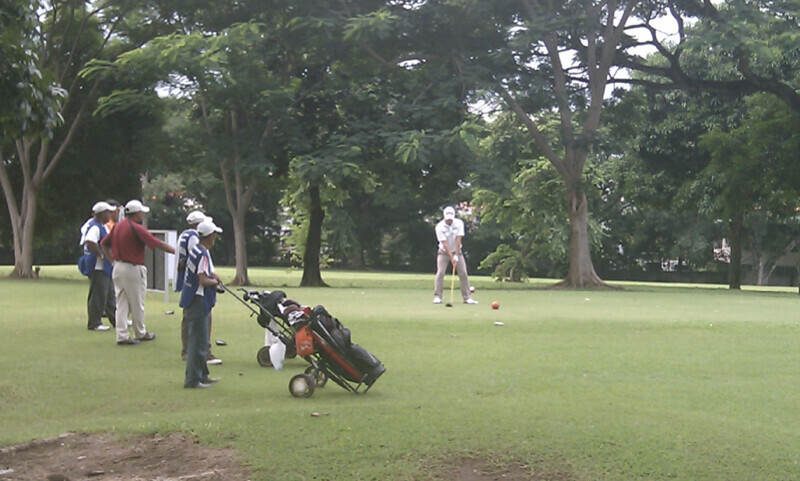 The Aboitiz Golf is a contest you and I should watch. Why? Simple. How often do these Manny Pacquiaos of Golf visit our land? Take Frankie Miñoza. You know him, right? Of course. Who doesn’t? Well, he’s here. Yes. No, he’s not in Japan, where he’s supposed to be playing—but here in Banilad, like he was yesterday, wearing a blue shirt and munching his snacks with Clifford Celdran and Montito Garcia after his 3-under first round. Vying for the P200,000 first prize (out of the total P1 million) are many of our country’s best, including names we only read about in the national newspapers: Juvic Pagunsan, Artemio Murakami, Jay Bayron, Mars Pucay, and the reigning Philippine Open winner, Elmer Salvador. Another attraction who’s here is Chris Rodgers. Just last weekend, the Briton and Angelo Que finished tied for first place in Malaysia—until Angelo, our 2008 RP Open champion, beat Rodgers in a playoff. The Aboitiz Invitational is Cebu’s first and the 10th leg of the 14-stage circuit named the ICTSI-Philippine Golf Tour. Armed with a P2.5 million budget, the Aboitizes made sure this event was first-rate. “We were given a dozen golf balls, a Nike cap, water bottles and other items, our green fees were paid for, same with free breakfast and lunch, plus two golf carts were issued per flight and all caddy fees were sponsored,” said Macky Michael, who was in the same flight with the father-and-son Anton and Toby Florendo and pro Richard Sinfuego during the Aboitiz Pro-Am tournament held last Tuesday. 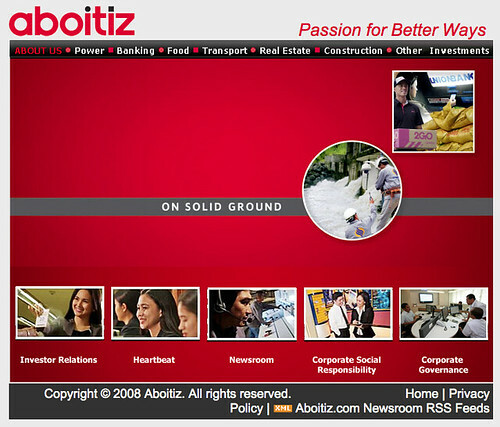 “Aboitiz is here to help sports. We love sports,” said Basti Lacson, the 6-footer Chief Reputation Officer of the Aboitiz Equity Ventures, when we met yesterday at the Country Club veranda. 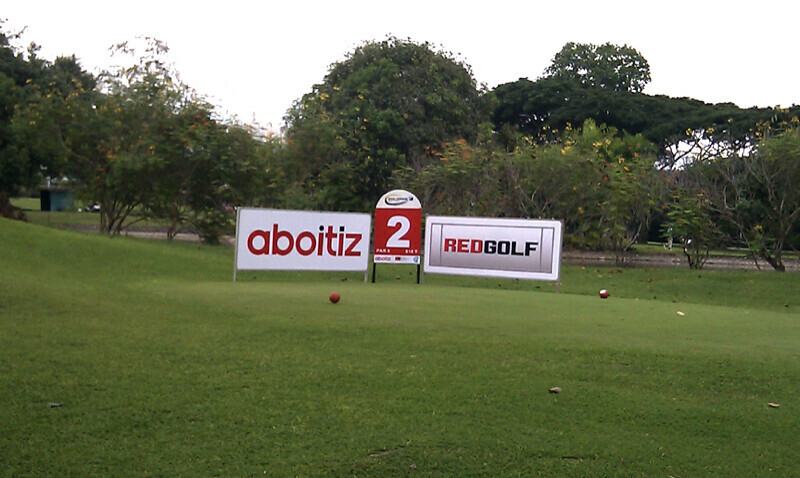 Thanks to this dynamic 90-year-old company named Aboitiz, RP’s best in golf are in town. Let’s watch!